Elohim (אלהים): Force, Creative force. YHWH (יהוה): Grace, Morality, Justice, Righteousness. In the Zohar, Elohim represents the force which sustains all below. [Bereshith 15a]. That these are different aspects of the One God is evident from a reading of Exo 6:2, when God (Elohim) spoke to Moses and said: "I am the LORD (YHWH)". God (Elohim) made man (Adam) from the dust of the ground (Adamah) in Gen 2:7, which has a gematria value of 2,999. The failure of men to turn to YHWH and reject our iniquities was spoken of in the Book of Daniel, in the very verse with a gematria value of 5854. 5854 is also the isopsephia value of a verse in Luke's Gospel, in which Jesus asked what is the kingdom of God like? A prime example of man's rejection of YHWH's covenant, and desire instead to be like gods (elohim), is told in the story of the Tower of Babel in the Book of Genesis (an episode which effectively ended the Noahic Covenant). When they said "build us a city" and "make us a name", the Hebrew word "us" (לנו) has a gematria value of 86 (Elohim). In Gen 11:5-9, it was YHWH and not Elohim who came down, confounded their language and scattered them abroad. The name was called Babel: because YHWH did confound the language of all the earth. The tower of Babel is depicted in the Bible Code, using an Equidistant Letter Skip of 1850 (50 x 37) beginning with the 12,853rd Hebrew letter in the Torah. The result of which is a tower of alephs reaching up to the top (rosh) in Gen 11:4! A tower of ten alephs beginning from letter 12,853 in the Torah and ending with letter 29,503, at an ELS of 1850. The tenth and final aleph of this 1850 ELS (the base of the tower of alephs) is the 29,503rd Hebrew letter in the Torah. There has been much written within these pages and elsewhere about the significance of the year 5778 on the Hebrew calendar (2017-2018), whilst 7872 is the gematria value of the verse in which Moses instructed the elders of Israel how to apply the blood of the Passover lamb. Continuing on the arboreal theme, the budding of Aaron's rod in the Torah is seen as a type of the resurrection of Christ. The verse relating to this miracle has a gematria value of 4111. The first occurrence of 21285 in pi is surrounded by an extraordinary sequence of nine 9's. The chances of a random occurrence of nine 9's is 1 in a billion. Following the sequence of 9's are the four digits 3996. 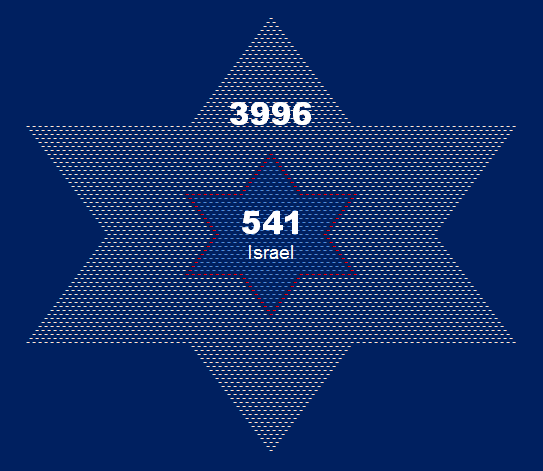 The gematria value of Israel (ישראל) is 541, which is the 100th prime and 10th star number. 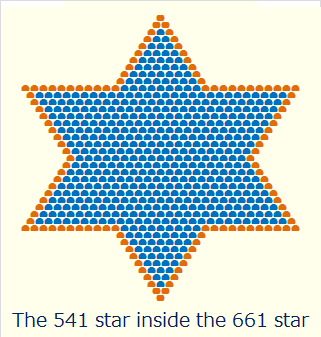 3996 envelops Israel to create the 28th star. This first occurrence of 21285 in pi begins at position 19,441. This number leads to a further arboreal reference from the Bible: the cursing of the barren fig tree that has long been a mystery. In this story, Jesus came upon a fig tree before the time of ripening. When he found nothing but leaves, Jesus cursed the fig tree, which subsequently withered and died. Who, without the gematria, could interpret this episode? 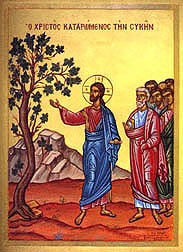 Byzantine icon of the cursing of the fig tree. Overlapping both sides of this tetrad of 86's (Elohim) are two numbers fundamental to Judaism and the concept of monotheism. One of the scribes asked: "Which is the greatest commandment of all?" This prayer, Judaism's daily declaration of faith, is known as the Shema, after the first word "Hear" (שמע), which has a gematria value of 410. 2701 is the gematria value of Gen 1:1 "In the beginning God created the heaven and the earth". The gematria of the Bible's two definitive creation verses are each the product of reflective numbers. Strangely, this reflective pattern is also found in the appearances of 26 (YHWH) within the decimal digits of e. To set the scene, the first occurrence of 26 in e is followed by it's reflection, 62. As befitting the Tetragrammaton, the next examples of reflectivity are to be found at the 4th, 8th and 12th occurrences of 26 in e. At the 4th occurrence, 26 begins at position 316, and is overlapped by it's reflection 613 (commandments in the Torah). Position 316 in e reads 26 either forwards or backwards. The 8th occurrence of 26 in e begins from position 1118 (Shema) and is preceded by it's reflection, 62. The 12th occurrence of 26 in e is also preceded by it's reflection, 62 which overlaps the preceding occurrence of 26. Between the first and second occurrences of 26 within the decimal digits of pi are 13 intermediate digits. Just as John 1:1 has a gematria value of 39 x 93, the first occurrence of 39 in pi is followed by 93. 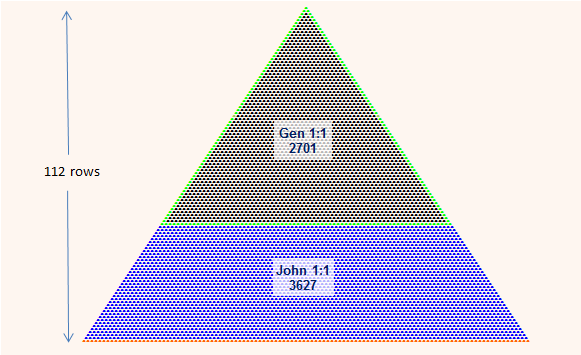 The John 1:1 trapezoid, which forms a base for the Gen 1:1 triangle, is 39 rows deep. The combination of Gen 1:1 and John 1:1 is 112 rows deep. The first occurrence of 541 in pi begins from position 1112. The next four digits, stretching out to position 1118, are 5069. Aaron's rod, which blossomed and bore fruit (see above), was the instrument for the first three of the ten plagues of Egypt (blood, frogs and lice). The verse describing these three plagues has a gematria value of 5069. "AND THE EARTH WAS VOID AND WITHOUT FORM. This describes the original state - as it were, the dregs of ink clinging to the point of the pen - in which there was no subsistence, until the world was graven with forty-two letters, all of which are the ornamentation of the Holy Name." The Torah was given in 2448, and the first appearance of 2448 in pi encapsulates the Abrahamic and Mosaic Covenants. 2448 is preceded by 430 (covenant with Abraham - giving of the Torah) surrounded by 99's (the age of Abraham when the LORD appeared to him). When the LORD appeared to Abraham, he said "I am the Almighty God" (אל שדי) pronounced El Shaddai, which has a gematria value of 345. Moses (משה) also has a gematria value of 345. From the burning bush, God (Elohim) said to Moses "I AM THAT I AM" (אהיה אשר אהיה) which has a gematria of 543 (the reflection of 345). There were 430 years between the covenant with Abraham and the giving of the Torah on Mt. Sinai. The total gematria value of the Names of God within the first four chapters of the Book of Genesis sum to 5,854 (see chart at top of this page). The number four is of paramount importance considering the true Name of God: The Tetragrammaton (YHWH). The first occurrence of 5854 within the decimal digits of e is remarkable for the fact it is surrounded on each side by the same three digit number: 366. There is only one chance in a thousand of this phenomenon occurring randomly, which invites further investigation. The 366th Hebrew word in the Bible is השמים (HaShamayim), translated as "the air" or "the sky" in Gen 1:28, and as "the heaven(s)" in Gen 1:1. HaShamayim is the fifth Hebrew word in the Bible, and the fifth occurrence of 366 in e is that which precedes 5854. The first occurrence of 366 in e is centered on position 541 (Israel). When God created the lights in the firmament of the heaven, He said "let them be for signs..." (Gen 1:14). In this verse signs (לאתת) is the 172nd Hebrew word in the Bible, which is the sum of the ages of the protagonists. 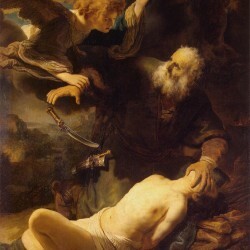 Sacrifice of Isaac by Rembrandt van Rijn (1635). The first occurrence of 172 in e is preceded by a rearrangement of the same three digits, 721. The 721st Hebrew word in the Bible is לקח ("taken") in Gen 2:22, which reflects 22:2. "And the rib, which the LORD God had taken from man, made he a woman, and brought her unto the man." The first occurrence of 5321 appears early within the decimal digits of pi, following the extraordinary dual appearances of the four digits 5778. The surface temperature of the Sun (the greater light) is 5778° K, and the second occurrence of 5321 in pi begins from position 1500, which is the isopsephia value of φως (light) in the original Greek (Strong's Number G5457). Whilst life (חיה) in Gen 1:20 has a gematria of 23, it is usually spelled חי (Strong's H2416), which has a gematria value of 18. The 18th occurrence of 5778185778 within the decimal digits of pi begins from position 197,690,316,484. The first occurrence of 18 in pi begins from position 424, which is the gematria value of Messiah ben (son of) David (משיח בן דוד). The first occurrence of 424 in pi is followed by the first occurrence of 541 (Israel). The angel measured the wall (built of jasper) and it was an hundred, and forty and four cubits (Rev 21:17-18) . The first occurrence of 13323 in pi is followed by the four digits 1666, which is the isopsephia value of τετρακισχιλιοι (Strong's Number G5070), meaning "four thousand". Significantly, the Jewish population of Israel has just passed the 6 million mark, which is equal to the gematria of Job 19:25 multiplied by four thousand. The term Annus Mirabilis, meaning "Miraculous Year" was first coined by John Dryden in his poem describing the events that beset England in the year 1666, including the Great Fire of London and the also the Great Plague. The University of Cambridge was closed due to the outbreak of Plague, which afforded 23 year old Isaac Newton sufficient time to work on his theories in calculus, optics, motion and gravitation; culminating in his universal laws of gravitation. The year 1666 is therefore considered Newton's Annus Mirabilis. Star numbers are of the form 6n (n-1) + 1. The 10th star number, for example, is 541, which is the gematria value of ישראל ("Israel"). The 11th star number (661) is the gematria value of אסתר ("Esther"), whose name means "star". The "Star of Esther" cocoons the "Star of Israel"
The Greek word τετρακισχιλιοι meaning "four thousand" (Strongs G5070) has a numerical value of 1666. Four thousand (τετρακισχιλιοι) years after Isaac Newton's Miracle Year, physicist Albert Einstein had an Annus Mirabilis of his own. At 26 years of age, Einstein published four papers in the year 1905. The last of these was on the subject of mass-energy equivalence (("Does the Inertia of a Body Depend Upon Its Energy Content?") in which he developed an argument for his most famous equation E = mc². 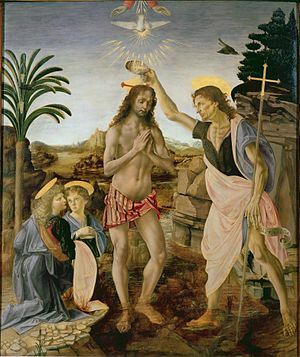 The Baptism of Christ by Andrea del Verrocchio (1472-1475). Verrocchio was assisted by his young pupil Leonardo da Vinci. At the time of completion, Leonardo was 23 years old, the same age as Isaac Newton during his Annus Mirabilis. Beginning from position 23 in pi are the three digits 433 (the 9th star number). Professor Raymond Flood lectures on Newton and Einstein. When God said "Abraham:" (Gen 22:1), and the angel of the LORD said "Abraham, Abraham:" (Gen 22:11, Abraham responded similarly when he said, "here I am", and then "Here am I", each translated from the original Hebrew הנני (hineni). The "Here I am" from Abraham recalls the "I AM" from God in Exo 3:14. In the original Greek, "I am" (εγω ειμι) has an isopsephia value of 873. The first occurrence of 873 (Jesus: "I am") in pi appears before the three digits 115 (Abraham: "Here I am"). This verse from the Book of Acts has an isopsephia value of 18359 and is verse number 27019 in the Bible. These two numbers encode the gematria values of both Deu 18:15 (1839) and Gen 1:1 (2701). The superfluous digits (5 and 9) multiply to 45, the gematria value of mankind (אדם). The roundelay from Nietzchke's Thus Spake Zaruhustra: "O Mensch, Gib Acht" seems most appropriate. What does deep midnight have to say? And deeper than the grasp of day. —Wants deep, wants deep eternity." Sebald Heyden's passion hymn, O Mensch bewein dein Sünde Groß (O Man, Lament Thy Grievous Sin) was published in 1525 and later used as the final chorus of Part 1 of J. S. Bach's St Matthew Passion (BWV 402). The 888th Hebrew word in the Bible is the last word of Genesis 3:9. When the LORD God called unto Adam (אדם), this last word is translated as "Where art thou? ", and is spelled איכה. This Hebrew word also means "lamentation" (see the first word in the Book of Lamentations). indeed for a long time on the Cross.